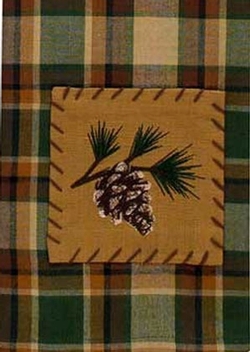 PD 499-45P - Scotch Pine Shower Curtain - 72" x 72"
New this year, this shower curtain features a plaid print that blends shades of warm evergreen, brown, and beige highlighted with quilt stitched patches of embroidered pine cones accenting the top border of the curtain. Available in a single panel with button holes (72" x 72"). Requires a liner (not included). 100% Cotton - Machine wash, line dry.